All week long you have thought about it and now the time has finally arrived. You gather your tools, put on your favorite hat and gloves, and head out to tend to your personal oasis; your backyard garden. This little piece of Heaven has been the place where all the cares of the work week slip away from your consciousness as you prune, weed and preen your “babies,” relishing in the colors and fragrances that have tickled your senses all summer long. But now, it is time to switch gears and move into the fall; planning new flower beds, trimming back summer perennials, and adding a few mums and shrubs are on today’s to-do list. Ah, life is good! But wait, out of the corner of your eye an intruder lurks, your ears pick up the faint, yet incessant buzzing of some airborne critter. You quickly try to access where “that thing” went as your mind tells you to reach for your favorite weapon…the “bug spray.” Now, your sole intent is to blast this uninvited guest to oblivion so you can get back to the task at hand and the relaxation you so sorely need. All too often this scene is played out across the United States with unintended consequences. Our propensity to use over-the-counter “bug” sprays without fully understanding the product label can actually work against the natural pollinators that our gardens and crops rely on. 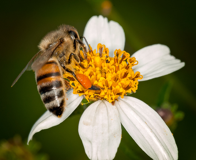 Over the years much has been written of Bee Colony Collapse due to pesticide overuse and with good reason, but often we forget that bees are just one of the important pollinators that regularly visit our gardens. Many other insects and birds that help our gardens grow can be affected by pesticide use. 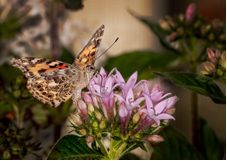 Consider butterflies or moths that flitter around your garden. They move back and forth sucking up nectar and moving pollen around as they go. While you would never intentionally spray these insects, you still may affect them when you spray for an offending wasp or ant. Even applying a product in a slight wind can cause drift, which carries the material to unintended places within the garden, often out of sight of our original spot of treatment. Many times we do not even have to actually “hit” the insect with a spray to affect pollinators. There is another class of pesticides that are systemic, effectively becoming part of the plant that can have an unintended effect on pollinators. Neonicotinoids or Neonics as they have become known, are a class of pesticides used for a variety of insect control. Originally developed for use against sucking insects such as aphids, they can be found in several over the counter products. Always take a few minutes to read and understand the label before use to protect against over-use and misapplications. It has been said that with great knowledge comes great responsibility. We all have a duty to protect our environment, both the professional pesticide applicator and the home gardener. Understanding this responsibility will help ensure that future generations will be able to enjoy the benefits of all the different pollinators that populate this Earth. For more information, visit Terminix.com.